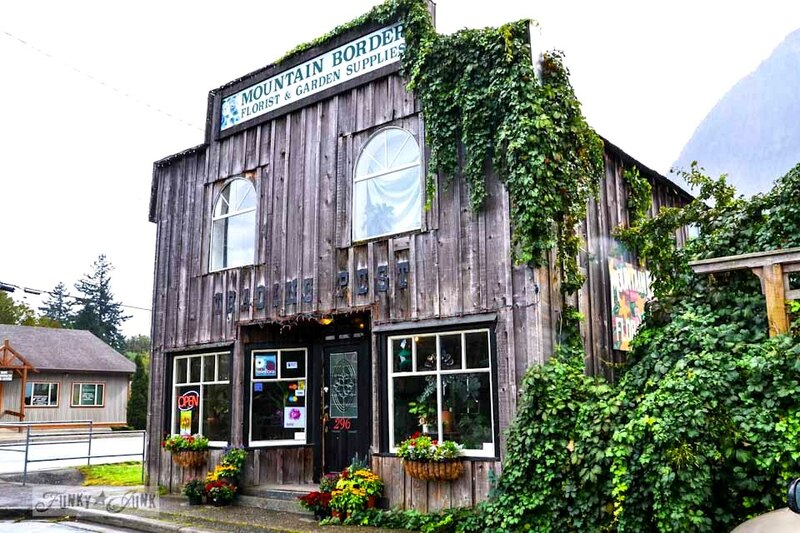 This magical find of reclaimed garden features at a Hope garden centre called Mountain Border Floral in Hope, BC Canada was a complete and wonderful fluke! When my son was at camp, I had a full day to tour the little town of Hope at my complete and utter leisure. Do you have any idea how thrilling it was to screech to a stop whenever you felt like it?! Sublime! While I did my big weave in and out of all the roads, I did a double take as I passed this lovely rustic garden centre, and HAD to turn back. 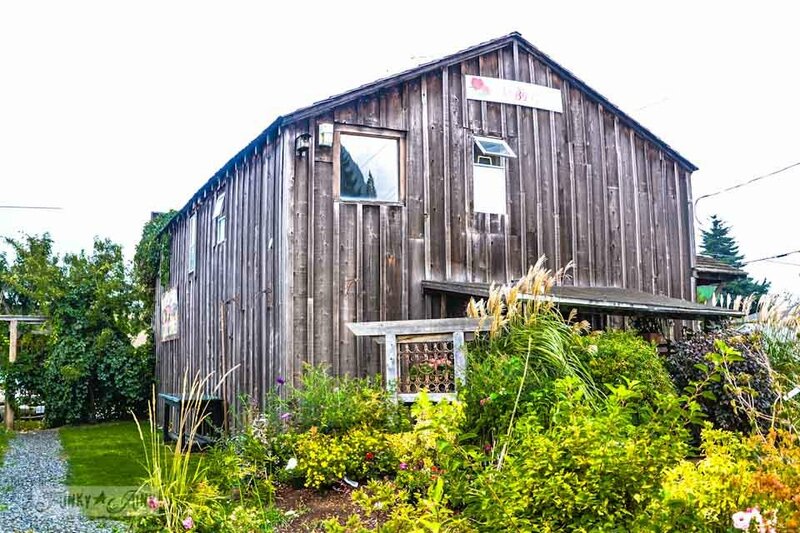 What caught my breath was the barn wood siding and the vines growing wherever they could possibly land. I’m a HUGE fan of a slightly overgrown garden look and was totally drawn in. It was a rainy day but that didn’t stop me. Grabbing my camera and tucking it under my hoodie, I giggled as I ran inside and asked permission to take a few shots of the outside of the building. 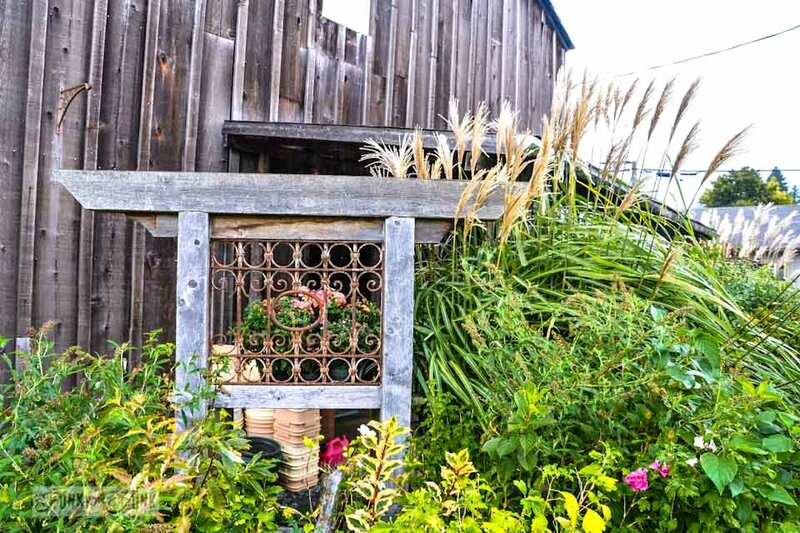 Capturing these photos was a means for rustic garden inspiration for my own yard. So for the gardeners out there, I think you’ll enjoy this little tour! Pots and pots and more flower filled pots were layerd on the front steps. I like that they could be switched out at a moment’s notice. 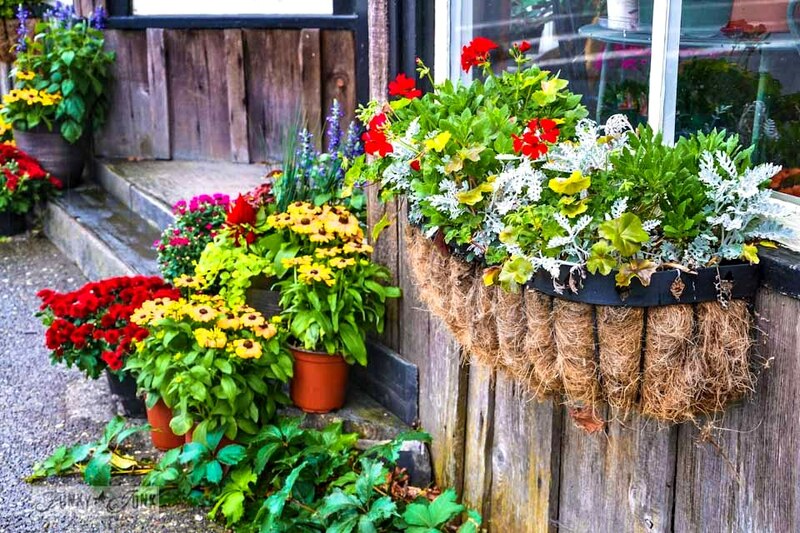 That rustic massive window box planter is amazing. I want one… no, a few just like it! 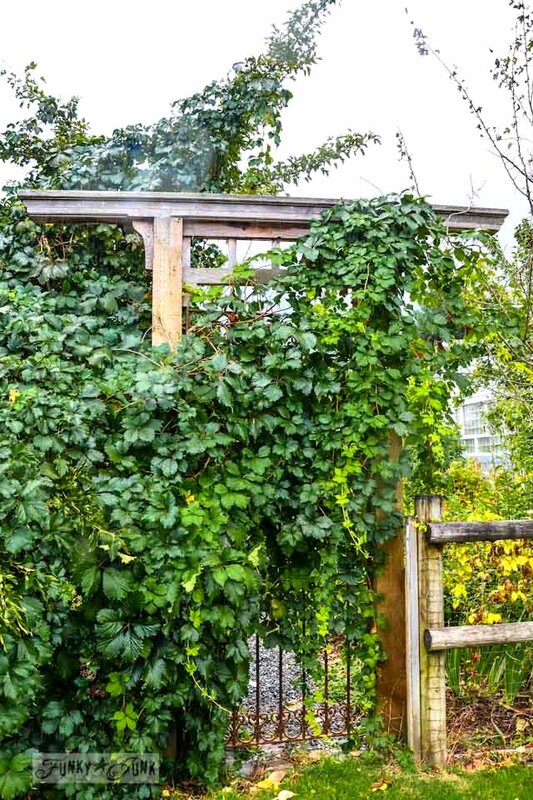 While I was snapping pictures of this amazing vine (not sure what it is), I couldn’t help but pay attention to the structure of that arbour. I then clued in that there was a builder in the midst of this place and was curious what resided beyond that vine. As luck would have it, the owner also invited me to the back yard as well to take a look around. EEP! Yes please! I wanted a shot of this building because I’m in LOVE with the board and batten treatment of the outside. You don’t often see this in a barn wood finish, but rather painted in either a colour or white. This would make a fabulous feature wall treatment, don’t you think?! 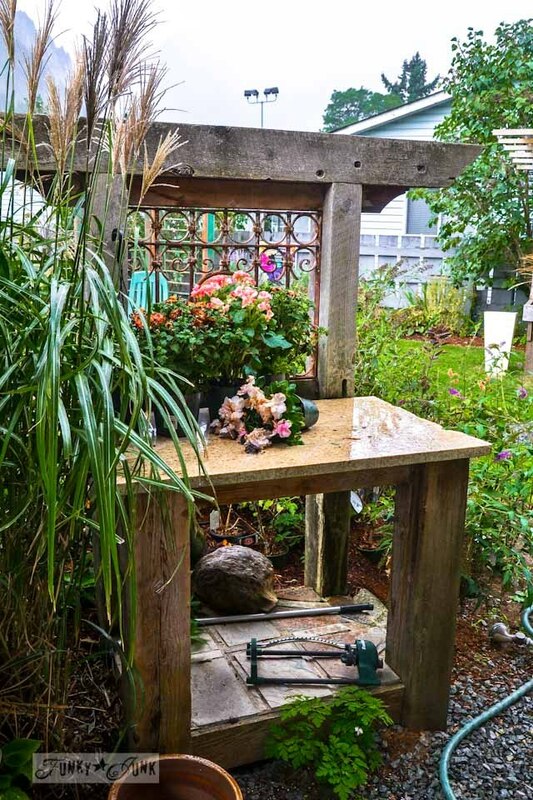 This little potting bench was created out of reclaimed wood, a metal iron gate of some kind and a slab of marble. It is cool! I adore that there’s no obstructing view with this design. Please do yourself a favour and click on the above picture to enlarge it. This garden shed is CHARMING. 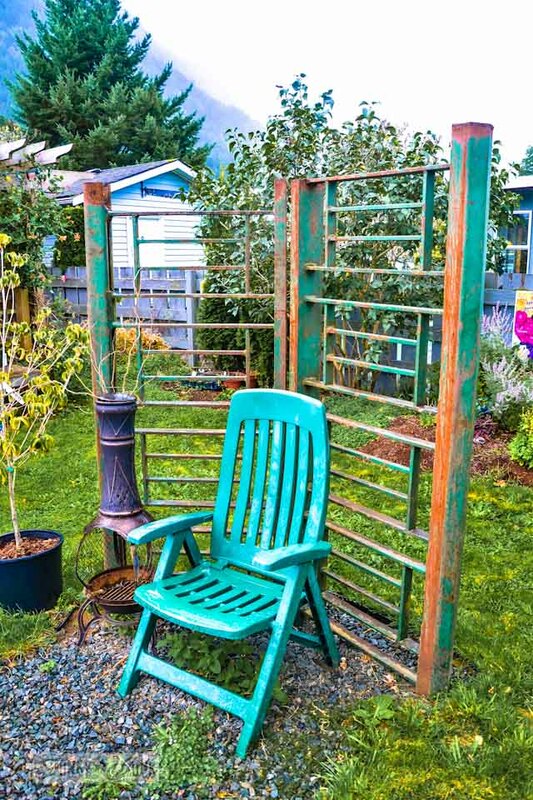 This partial starburst styled metal gate?? was fabulous. The different tones of rust turned this piece into a work of art. This is a little hard to make out but it was worth a shot. 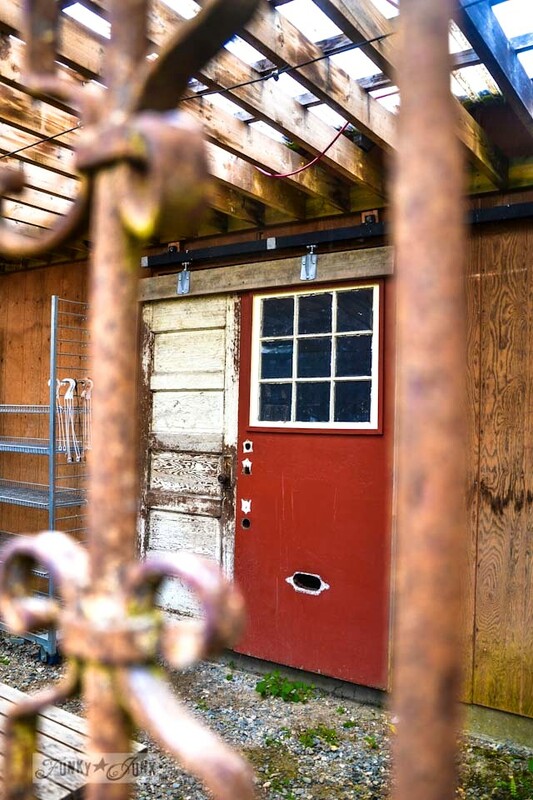 (literally) The two doors you see are attached as one for a sliding barn door. Genius! This funky little gate made me smile! It didn’t match anything around it, yet it belonged right in that very spot. I have no idea what this heavy metal backdrop is, but I think it would be a fabulous feature with a trailing vine all over it. 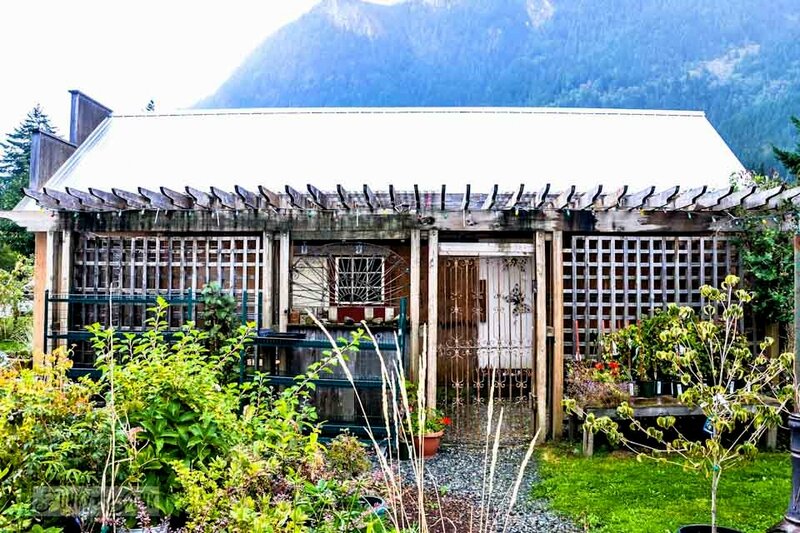 This cute little garden centre was for sale with an upstairs loft to live in. So cool! I would have loved nothing more than to have that whole building as just my house, but on small acerage. Hey, a girl can dream! This little walk made me wish it was spring so I could get out there and create some of these ideas! Oh well… this way we have all winter to collect, right? Which feature was your favourite? 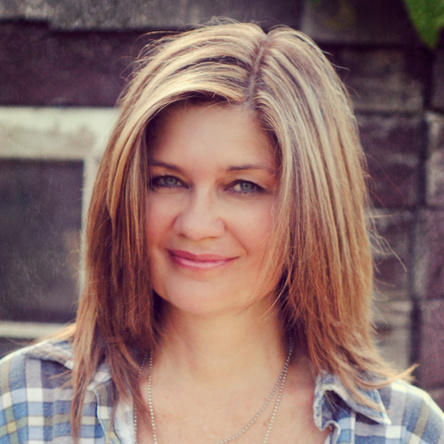 Hi Donna, as always your posts are very cool and inspiring! 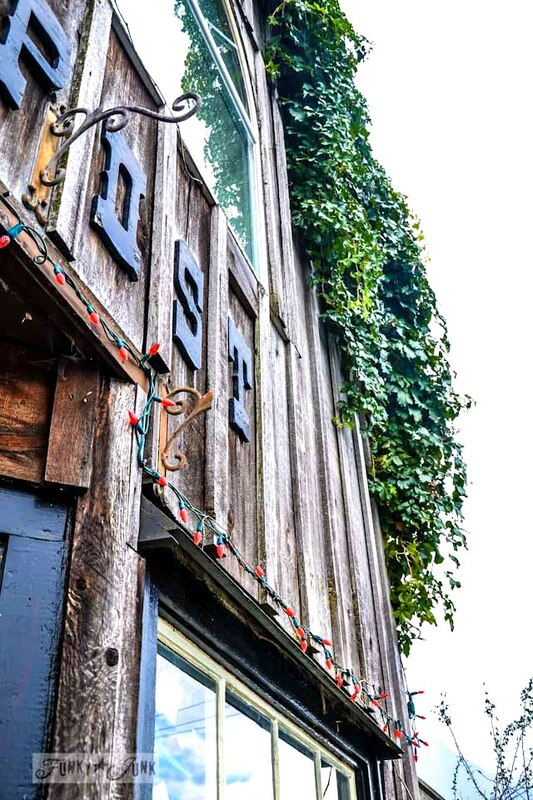 In Glen Mills, PA and Westport, CT, there are two awesome garden centers owned by the Anthropologie/Urban Outfitters folks known as Terrain. These magical places are the ultimate repurposed and resplendent projects of this interesting caliber. At the Glen Mills location, they have restored a 100 year old garden center and their numerous outbuildings into various showrooms around the gardening theme, including an antique green house transformed into a much sought after bistro. At the Westport address, they restored and converted a nearly abandoned Cadillac dealership eyesore into an unbelievable mecca geared toward gardening, which also includes their style of a cafe. Both places are breathtaking in themselves and should be visited when in these respective areas. 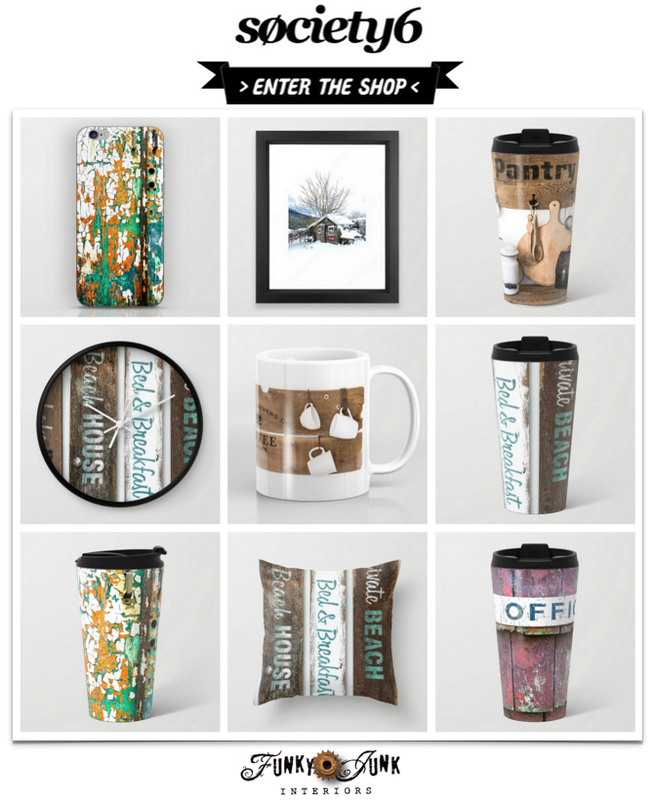 Please check out their website at http://www.shopterrain.com. Enjoy! Ken! That place sounds amazing, I wish I could visit in person! It’s on my shopping / travel list. 🙂 Thanks for the kind words! A-M-A-Z-I-N-G!! 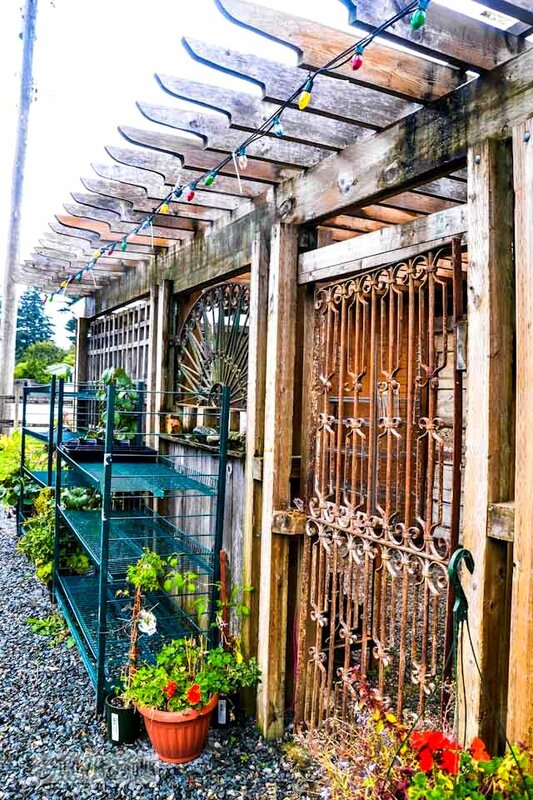 Love the whole thing – I am thinking that metal thing was once a railing on a porch and now is turned on its side…whatever it was – the whole place is fabulous…so many cool ideas there – thanks so much for sharing – the inspiration is great! Incredible Donna!!!! Oh I adore every square inch… that vine looks just like my Virginia Creeper. Ours has made it’s way from our back garden to over our deck and up the side of our home. I love it. Now that Fall is here, it has turned a dark red. 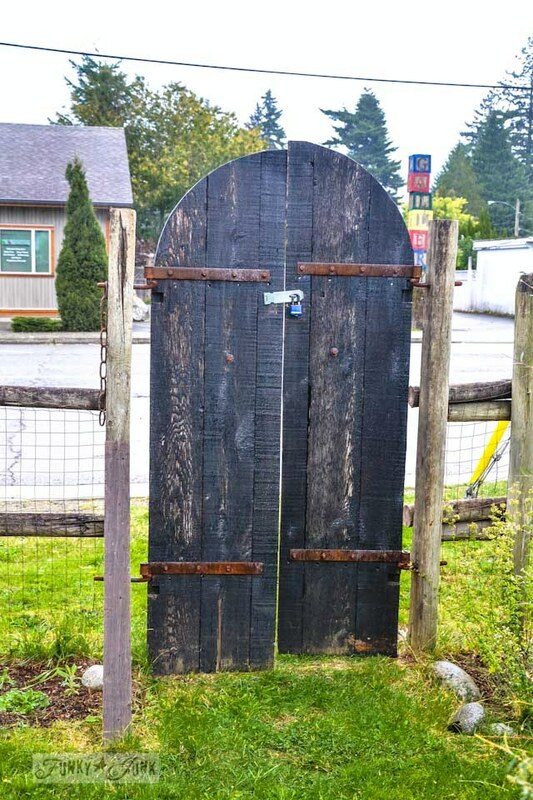 Those repurposed gates are amazing – and I see a hint of asian influence in some of those board cuts, no? Really cool. That is one of those places where I would love to just make myself at home, grab a book, and laze in the garden all day. I’m a sucker for ironwork- I could use that piece above the potting bench in so many spots. Donna you find the best places to explore. We were just through HOPE, BC but of course we just whizzed through as so many people do as they head to a destination – darn. Good for you for taking the time to check these places out AND share them with us. Thank you. Hey Mardy! I’ve been to Hope many times but it wasn’t until I had an entire day to just myself that I could even attempt to explore like this. Everyone deserves a day just like that! 🙂 Glad you enjoyed the tour! That is my kind of place. I would love to have the hole thing at the back of my property. It certainly gave me idea’s what to collect this coming long winter season, but won’t that be fun. I think my favorite part was the in-closed area with the different iron windows. Love that garden Center and those architectural accents. I’ve only ever driven through Hope…. Hope that your son enjoyed camp! 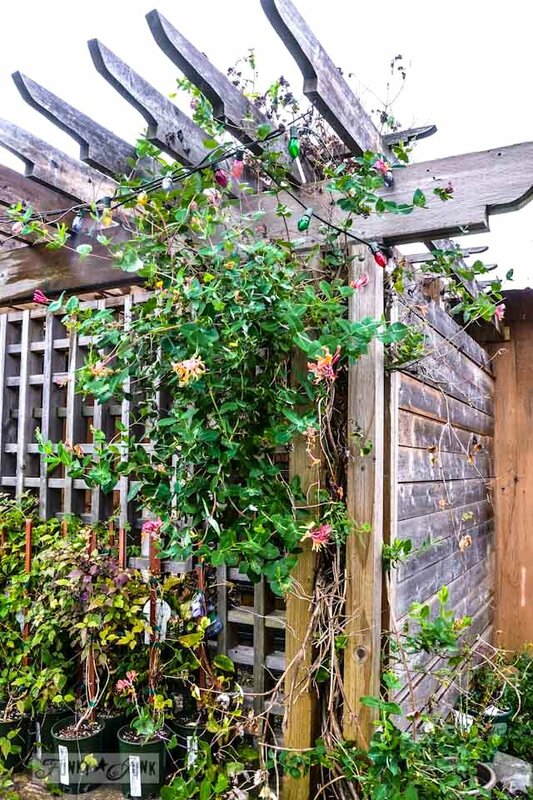 “I’m a HUGE fan of a slightly overgrown garden look and was totally drawn in.” too! Thanks for stopping & taking us on this ‘garden tour’, it was lovely, just lovely! What an amazing place. Thanks for sharing. I love it all and the flowers were beautiful and all that greenery. WOW. Lovely! Just lovely, and thanks for sharing with us. 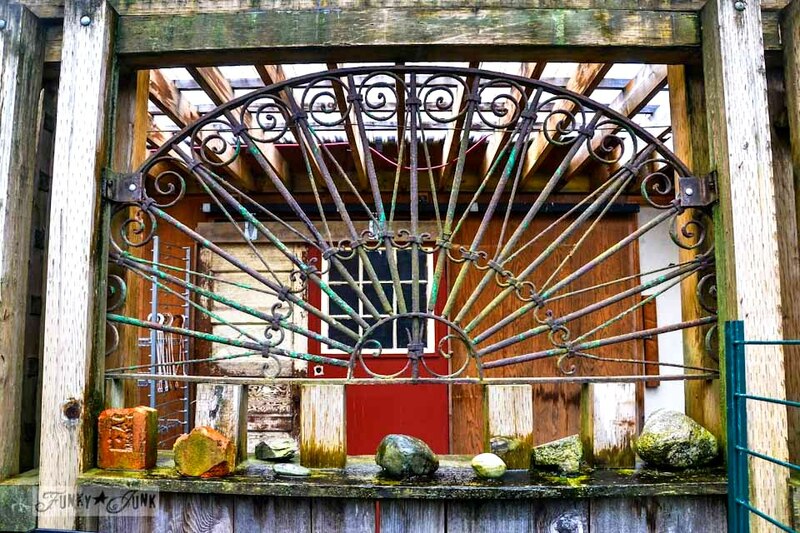 Oh it had to be that circular rusted piece with all the colors – beautiful! That place was really cool! 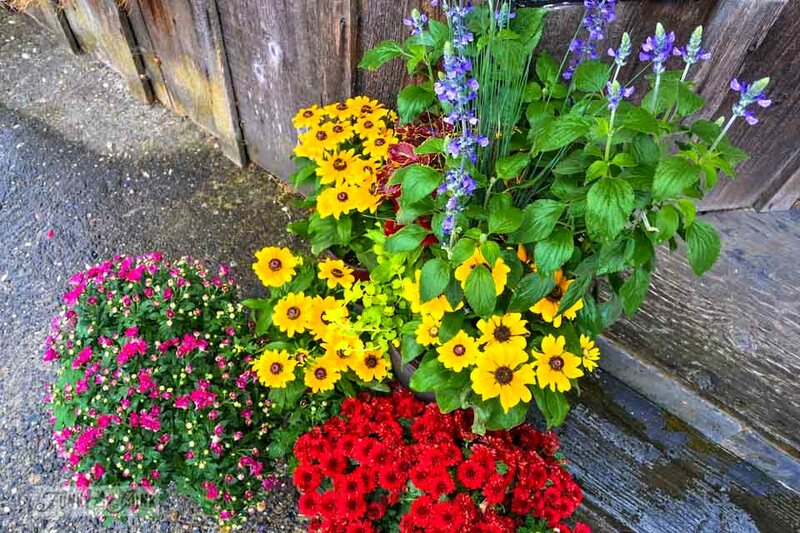 What a treat for this gardening lover. Loved it all, especially the mismatched barn doors and the uneven gate. I love things like that! 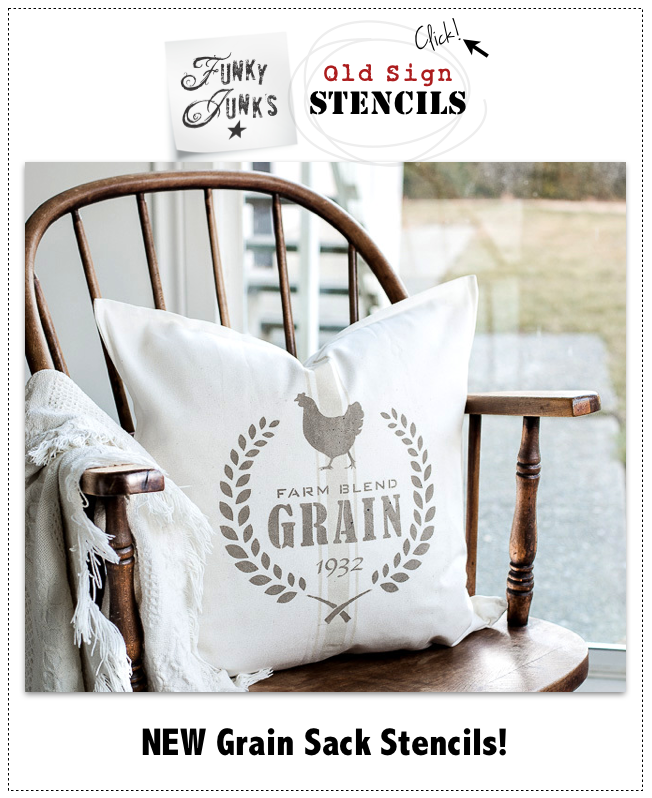 As you say, it makes you long for Spring already so we could get started. But using the time to collect things is a good one. Now to start a list….thanks so much for the tour. What a beautiful building. Love the shed out back. I love when I can have a day off to just do whatever. Glad you got the chance! This looks like a fairy tale of a place to live and work. …can’t wait for Spring either. Oh my God, what a treasure!!!! Amazing what we can find, fit here close to us???? I wish I was looking for a place in Hope!!!! The vine on these buildings are choke vine. I also believe they are called kudso vine. They are extremely invasive and kill everything they attach too. Trees, plants buildings, etc. I agree it is a gorgeous vine but ever so destructive and once established they are very difficult to kill off. I am loosing half the trees in my windbreak orchard due to this vine. I have chopped, pulled and poured every plant killer on them you can think of and they still manage to come up somewhere else. I believe the spelling is kudzo. but not sure.